GL Lighting is proud to present our high-quality Vapour Proof Fittings. As well as being Vapour Proof they are also dust and corrosion resistant. These Vapour Proof Fittings come in 1200mm and 1500mm single and double fittings. A high quality commercial type fitting. IP65 rating which means it is vapour proof, dust and corrosion resistant. Unit has a ABS base, polycarbonate diffuser lens, stainless steel mounting brackets and polycarbonate clips. Fitting is supplied standard without LED tubes and is wired for LED. 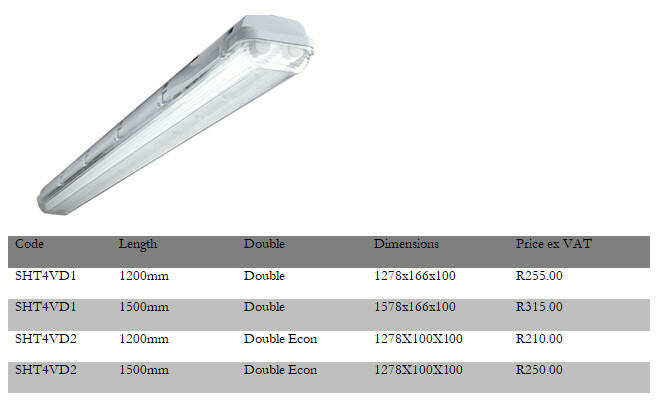 Refer to the tube light section on our website for our range of LED tubes which includes the Standard, Premium and Premium + Range tubes which are manufactured in Edenvale, Johannesburg, Gauteng, South Africa. We also supply to other African countries, including but not limited to: Zimbabwe, Namibia, Botswana and Mozambique. For any queries please find us at www.tubelights.co.za.